A free mobile app is a bit like having a nutritionist with you in the store. Drop that yogurt, it might prompt. Instead, try this one with less sugar, fat, and fewer unpronounceable additives. “FoodSwitch is unique in that users don’t have to hunt for healthier alternatives. They’re all listed in the app,” says FoodSwitch collaborator Mark Huffman, associate professor of preventive medicine and medicine at Northwestern University Feinberg School of Medicine and a Northwestern Medicine cardiologist. The app is available in the Apple and Google Play stores. Unlike other nutrition apps, FoodSwitch asks users to crowdsource information on new and changing foods within the US food supply to update the app’s 268,000-product database in real time. Given that 20 percent of the packaged foods in the US turn over every year, having a constantly updated database helps track what is in the global food supply and how healthy it is. With a tap of the screen, users can scan a packaged food’s barcode, quickly see its nutritional rating, and identify similar foods that are healthier. The app provides a simple Health Star Rating that scores each food between 0.5 stars (unhealthy) to 5 stars (healthiest). The scoring results from a scientific algorithm that weights the impact of different nutrients on health. The app also provides a breakdown of the food’s fat, saturated fat, sugars, and salt in grams and gives a percentage of an adult’s daily intake for each. This appears as red, yellow, and green traffic lights. When a food gets few stars or multiple red lights, consumers can see it’s high in fat, saturated fat, sugars, and salt. “That’s when you should take a step back and say, ‘Maybe I shouldn’t be eating this. What else is out there? '” Huffman says. If a user scans a barcode and the food is not in the database, the app prompts the user to photograph the packaging, its nutrition facts panel, and the ingredient list so the app’s team can add it to the database. This type of crowdsourcing is vital for the app’s success, Huffman says, because manufacturers frequently update or add products, and independent grocers carry foods that are not always found in mainstream grocery stores. FoodSwitch has already launched successfully in Australia, New Zealand, the United Kingdom, India, China, South Africa, and Hong Kong. By expanding the app’s reach to the US, which has the largest food supply in the world (about 400,000 foods compared to 150,000 foods in Australia), the number of foods in the FoodSwitch database should more than double. The app also features specialized filters. Excess sodium in one’s diet can lead to high blood pressure, the “silent killer,” and the majority of excess salt in peoples’ diets comes from processed foods. A SaltSwitch filter within the app can guide users to foods with less salt. 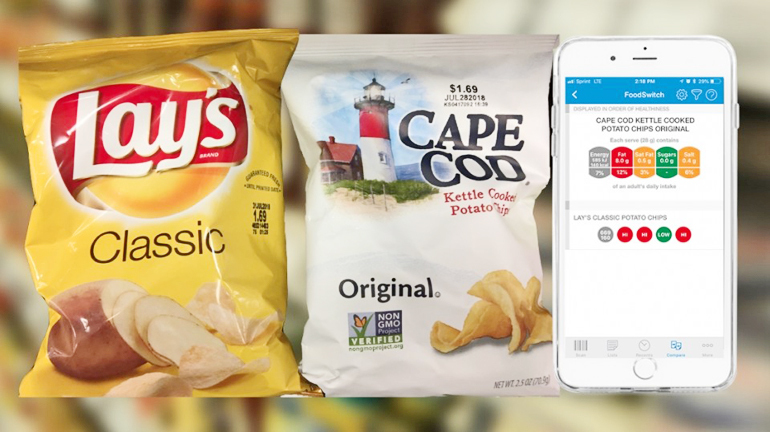 During a recent grocery shopping trip, a SaltSwitch scan of a bag of Lay’s classic potato chips resulted in three red traffic lights (fat, saturated fat, and sodium) and one green traffic light (sugar). The list of healthier alternatives suggested trying Lay’s Lightly Salted Potato Chips instead, which had only two red traffic lights (fat, saturated fat), one yellow traffic light (sodium), and one green (sugar). Funding for FoodSwitch USA comes from One Brave Idea, a research program that the American Heart Association, Verily, and AstraZeneca sponsor. Calum MacRae at the Brigham and Women’s Hospital and Harvard Medical School leads it. FoodSwitch USA is the work of the George Institute for Global Health in Australia in collaboration with Northwestern Medicine and Chicago-based Label Insight.